It’s time to let Gov. Bruce Rauner know that we want him to sign HB1785, the bill that will allow transgender Illinoisans to have a birth certificate that matches their gender identity. 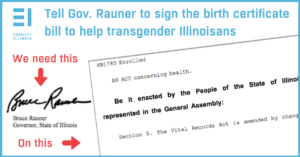 The right-wing opponents are already hard at work spreading lies about the bill, and we need YOU in every corner of Illinois to click HERE to send a positive message to the governor’s office in support of the measure that helps transgender Illinoisans correct this essential document. It takes just a minute. Stop by our booth this weekend at Andersonville Midsommarfest 2017 to sign the message, or anywhere in Illinois click on THIS LINK.